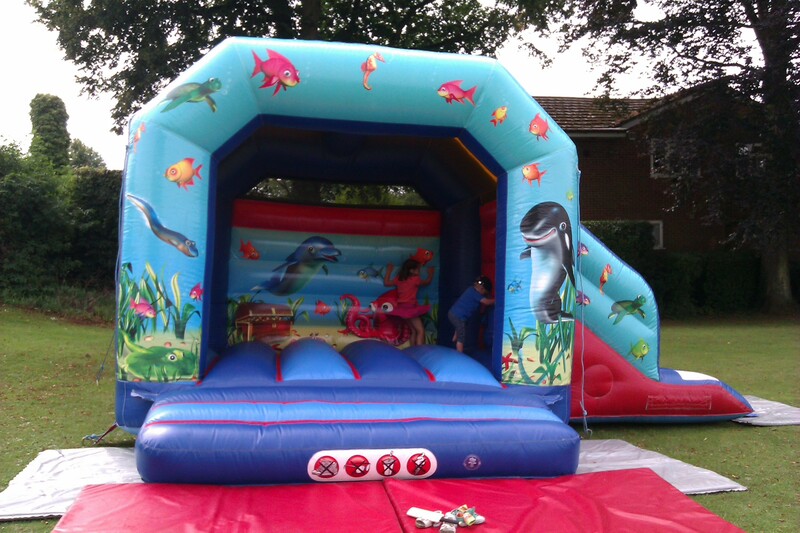 Our undersea bouncy castle provides children with a large bounce area and the fun of a slide. Will it fit in your garden? Number of users: up to 1.0m height 8 users. up to 1.2m height 6 users. 1.5m and above 4 users. Recommended age of users: children up to the age of 14 years. Recommended set up and pack away time: the castle inflates in approx 60 seconds and takes approx 15 minutes to deflate fully before it can be rolled and returned to bag. Suitability: Indoor or outdoor use, but please check for adequate space. Safety mats, extension lead, blower and stakes (for outside use) or sand bags (for indoor use) provided. The Bouncy Castle is fully BS EN 14960 compliant. The bouncy castle will need to be collected from Goring. You will need two people to carry / set up / pack away. An estate car, MPV or van is recommended for transporting the bouncy castle. Delivery and collection may be arranged at additional cost.